Like I said, I love libraries. They have always have been an important part of my life. Growing up, they were places that a fanciful introvert like me could get away from my drab surroundings and encompass myself in countless worlds. As an adult who continues to be a media-hound, the library is still my watering hole. Everywhere I’ve lived for long enough, I’ve had a library card. I have a collection: Rhode Island, New York, San Francisco, Denver, and Kirkcaldy (the largest town in County Fife, Scotland). Now, I work part-time at my local branch as a library aide. Libraries offer us nearly unlimited resources for self-directed education, entertainment, and community. I don’t like schools (more on that later), but I love libraries. They are among the few places where money and socioeconomic class are not barriers, where anyone can become a better, happier person—by their own definition and in their own right. Did you know that, in most areas, you can use your library like Netflix? You can access your account online, put items from other libraries in the network on hold, have them sent to your local branch, then get a notification when they’ve arrived. And, increasingly, you can get library books on e-readers and iPads/Pods/etc. Did you know that in addition to books, libraries lend out things like magazines and local publications, CDs and DVDs, sometimes even artwork? In fact, libraries can get new releases of media before they are available to the public. (Don’t ask me how that works, but I’ve seen it with my own eyes.) All the newest movies, Blu-rays, TV shows on DVD, and music can probably be found at your local library. Did you know that libraries are not just about lending out stuff anymore? Because their funding is so tenuous (sadly, frustratingly tenuous) and often based on the results of public vote, they have to keep up with the times. Libraries serve as hang-outs (one near me has a café in it) and family-friendly spaces (such as story times for kids). Libraries host free community events and workshops, like local music concerts and classes on all sorts of things like using computers and building your resume, and of course book clubs and literature readings. In fact, if you need a space to host an event, check out the library. 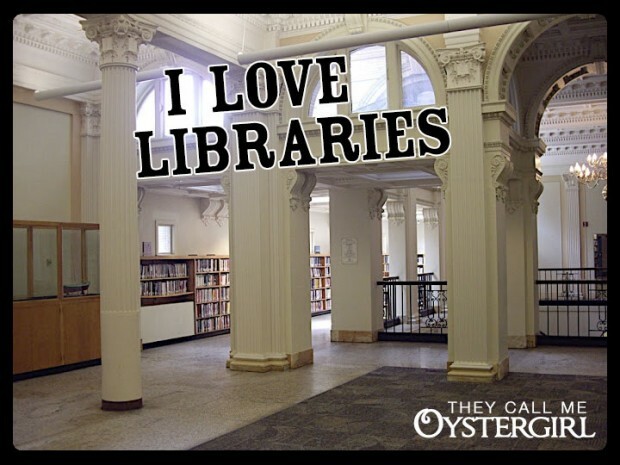 Did you know that LIBRARIES ARE FREE?? You can hang out there for free, use the Internet for free, get a library card and take out things for free. This is because of government funding, and, because that’s becoming so paltry, community funding as well. In fact, you should take advantage of all the free things your library offers, because they keep track of the numbers, and that’s how they get more funding. So you see, there really are some things for free… as long as somebody else is paying for them!